Sovereign Silver Dropper-Top, 8 oz. As corroborated by a university study, Sovereign Silver® contains 96% actively charged silver particles (positively charged [Ag+] silver ions), which renders it at least 34 times more powerful than other brands. Sovereign Silver’s® unprecedented average particle size of 0.0008 microns, or 0.8 nanometers (validated by Transmission Electron Microscopy), allows for easy utilization by – and excretion from – the cells and body. Our ultra-small particle size also results in a greater silver surface area. That’s why even with a low concentration of 10 ppm (parts per million), Sovereign Silver® is still much more effective than brands that contain up to 500 ppm! 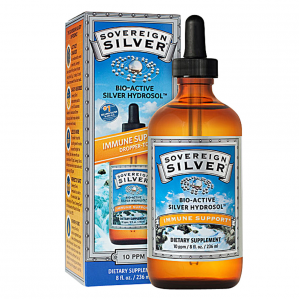 Sovereign Silver® is formulated to be safe for the whole family when used as directed. 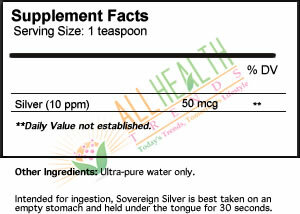 Taken 7 times a day for 70 years, Sovereign Silver® still falls below the EPA daily Oral Silver Reference Dose (RfD). According to the EPA (CASRN 7440-22-4) daily Oral Silver Reference Dose (RfD) applied to 10 ppm, one may ingest 178,850 dosages safely over 70 years. Note: Although the dropper only fills up half-way with 1 squeeze, this is considered to be 1 dropper.